In light of the Columbine High School and the recent Red Lake, Minnesota massacres by disturbed teenagers, L. Sprague de Camp's "Judgment Day," from the August 1955 issue of Astounding Science Fiction is more timely and relevant than ever. (Originally published in Astounding Science Fiction, August, 1955. This is the ultimate Revenge story, in that the fate of the Earth and humankind is at stake and is to be decided by a single individual. Physicist Wade Ormont has discovered a process whereby the lowly element lead can be used as a strange catalyst in combination with other processes to transform the substantial quantities of lead in the earth's crust to release enough nuclear energy to destroy the entire planet. After checking and rechecking his calculations, he debates whether to release his paper or not, knowing full well that even if buried for security reasons it will eventually be leaked, and most likely trickle into the hands of crackpots or blackmailers or worse, who would have no moral compunctions in using his findings to destroy the world. The bulk of the story then switches to Ormont's own psyche and upbringing as a frail and bullied child. Genetically intelligent, but physically frail and uninterested in interaction with his fellow schoolmates, he is hazed, bullied, embarrassed and tortured to no end—both in public school and a short stint in military school, which was his mother's idea but which his father was against. He never dated until he was thirty, and following a brief failed marriage has given up women altogether. With some small measure of conscience, aware that most of the men and women on Earth have never harmed him, he nevertheless carries a lifelong grudge against those who bullied him in his youth. He arrives at the following conclusion: "There is one way I can be happy during my remaining years, and that is by the knowledge that all these bullies will get theirs some day. I hate them. I hate them. I hate everybody. I want to kill mankind. I'd kill them by slow torture if I could. If I can't, blowing up the earth will do. I shall write my report." It is easy to see (given the impact of the narrative itself) why this story was so popular at the time. It embodies everything (though in a much darker way s-f fans and readers would not condone) what typical s-f fans believed themselves to be throughout the 30's, 40's, and 1950's: the intelligent, rather socially inept, misunderstood outsider (not that different from fans today). This is a prevalent theme in much s-f virtually from its beginnings; witness Stanley G. Weinbaum's classic 1939 novel The New Adam, and Henry Kuttner's fix-up 1953 novel Mutant (with stories from the 40's), which ties together several of his "Baldie" stories, Baldies being telepathic mutants following an atomic war, and how these different and "superior" survivors were feared because of their differentness, when their sole purpose was merely to get along and assimilate themselves into the new, post-holocaust society. They thus took every social and educational avenue to hide their newly-acquired abilities, who nevertheless were shunned (at best) and even hunted to near extinction when periodically exposed. In retrospect, this disturbing story presages by some forty-five plus years the Columbine High School massacre calculatedly executed by a pair of misguided youths, tormented and bullied by their fellow classmates, who also found reason to actualize their revenge in a sadly more horrific and immediate fashion than the delayed manner portrayed in "Judgment Day." Witness, too, the recent Red Lake, Minnesota massacre of eight by a student who then also killed himself. 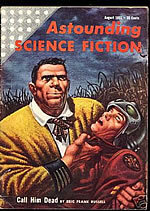 Some science fiction stories are indeed timeless.